There are people who believe musicians should not be paid because music is a ministry and therefore it must be done with volunteers. Others claim that their churches are small and that their budgets do not allow them to pay anyone. Topics that have to deal with money are never treated lightly and people become emotional when it comes to money issues. Some people claim that it is the devil who has swept through churches causing musicians to want to be paid for their service of playing. Some musicians go to the extreme of not playing if the money is not there. Though I do not advocate for such an attitude, I believe that musicians should either be paid, receive a love offering once in a while or at least transport money to help them in the work that they do. 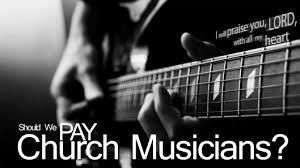 It is biblical to pay musicians for the work that they do in the church. I believe this helps the musicians to focus on the ministry and prayer as they are not busy trying to make money and serve God at the same time. In some churches have no problem paying musicians. However, in Africa that’s not the case. Musicians are not paid and yet expected to be fully committed to the ministry. This does not make sense. 1 Chronicles 9:33 says "and these are the singers, chief of the fathers of the levites, who remaining in the chambers were free: for they were employed in that work day and night"
And in Ezra 11:22b-23 says "of the sons of Asaph, the singers were over the business of the house of God. For it was the Kings commandment concerning them, that a certain portion should be for the singers, due for everyday"
Yes these guys were employed to do God’s work. It’s not about doing it for the money but let’s face it no one can live without money! For it is written in the law of Moses, Thou shalt not muzzle the mouth of the ox that treadeth out the corn. Doth God take care for oxen?Or saith he it altogether for our sakes? For our sakes, no doubt, this is written: that he that ploweth should plow in hope; and that he that thresheth in hope should be partaker of his hope. Some will argue that this scripture is talking about teachers of the word and does not apply to musicians. A musician is actually a teacher of the word through song when you actually think about it. When should a church/ministry start considering to employ full time musicians? If the church desires to maintain and establish a prestigious standard of music (especially churches that write and record their own music). Such churches have a music director, several instrumentalists and choir members on a payroll to be able to achieve this because when a person is paid, the church has a right to expect a higher level of commitment and excellence. If the amount of time needed to do the work of the ministry exceeds what is reasonable for a typical church member to give then the church should definitely consider employing. If the churches musicians are constantly giving excuses that they cant make it to practices and services because they are looking for money a church might want to consider paying. There is an insight in Nehemiah concerning this particular situation. In Nehemiah 13:10-11 it says And I perceived that the portions of the Levites had not been given them: for the Levites and the singers, that did the work, were fled every one to his field. Then contended I with the rulers, and said, Why is the house of God forsaken? And I gathered them together, and set them in their place. Ensure the musician has your church at heart and is not just in it for the money- this is very important because you need someone who loves the church and wants to serve. In this regard it will be wise to employ from within the church, from someone who has been serving already on a volunteer basis because you know they should have a genuine love for the ministry otherwise they would not have been in the church in the first place. I strongly advise against hiring a musician who is not even part of your church even if they might be a professional musician because most of the times the only reason that person will be coming through is because of the paycheck and not out of a love for the church and they will have a lower commitment and loyalty to the church than a volunteer who can then be trained to get to this professional level. Establish a mentoring program- even when you employ musicians you need to be constantly training more musicians, especially the younger crop so that there can be continuity if the employed musician desires to move on with their life. You might even make training the next generation part of the employed musician’s job description. Ensure though that the employed musician does not see his mentee as a threat to his job security because then the employee will struggle to build a culture of development as they might see this person as a replacement. Clearly define your musicians Key Result Areas. Many churches after employing musicians start feeling as if they are just paying people to sit and practice then play in a service. You have to lay out your expectations and to avoid just paying people to sit I advise you add some administrative duties on top of the obvious one of playing and singing in a service. Get the musicians to draft reports and plan services way in advance and then also doing things like chord charts. Also for songwriters they can start writing songs for your church for the purposes of recordings that you can then use to raise money to pay the musicians. Find out the vision and direction of the musician you want to employ. As much as we might not like not everyone is meant to stay, certain people come into our lives for a season. Before you employ someone find out what they want to do with their lives, find out if they feel called to the music ministry and if they are called to your church for good or they are available for a season. Even if they are going to leave after a season don’t use that against them so you don’t employ them, just employ them on a short contract. This applies especially for kids who have just left school and are looking for something to do before they go to varsity. In the case of such an individual ensure that they train a replacement who can do the same tasks they were doing. Some musicians will want to do their own recording projects. This is not a bad thing. So many ministries might feel threatened by someone who is entrepreneurial fearing that they might eventually leave the ministry or have their commitment waver because of their projects. This is not even the case, it’s actually good to employ such people. I do my own projects but am fully committed to my church, I think also of Israel Houghton who travels all around the world and has done various projects and yet is committed to his home church Lakewood!